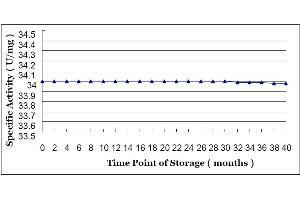 Shelf life of proteinase K lyophilized powder: Proteinase K lyophilized powder stored 40 months at temperature below 4°C showed very slight loss (less than 0.5% ) on specific activity. Purpose Proteinase K is commonly used in molecular biology to remove protein contamination. 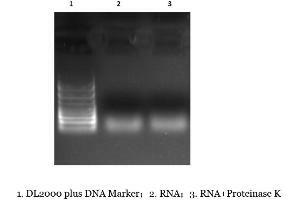 Specificity DNase is not detected in quality control procedure of incubation 40 µg Proteinase K with 1 µg λ DNA for 6 hours at 37°C. 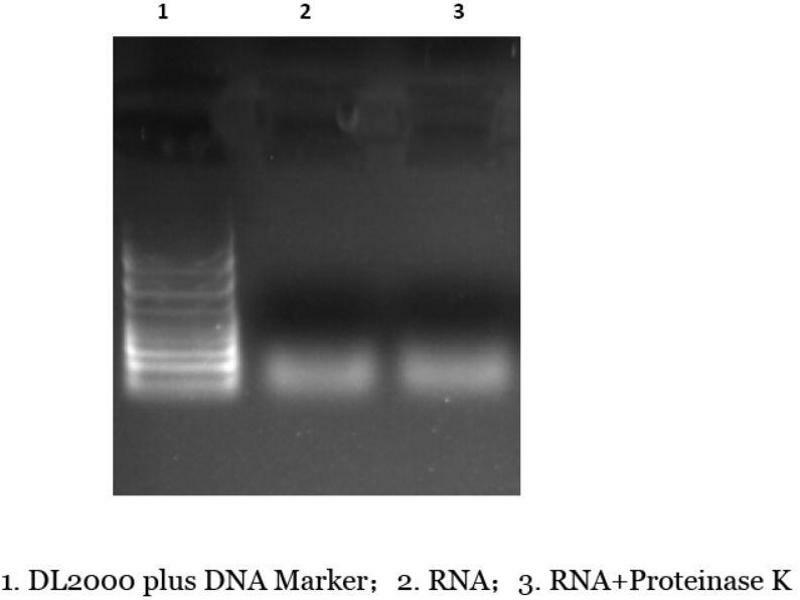 RNase is not detected in quality control procedure of incubation 40 µg Proteinase K with 2 µg RNA for 2 hours at 37°C. 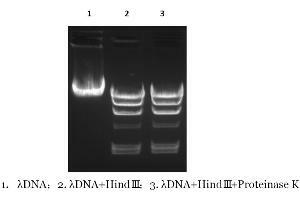 This preparation is considered as RNase and DNase free. Each lot was tested to ensure the absence of Nucleases and DNA. Characteristics Molecular Biology Grade, Recombinant, from yeast cells with cloned gene encoding genetically engineered Engyodontium album (Tritirachium album) endolytic protease. The recombinant enzyme is a mutant to the native protease, which gains higher specific activity and yield as well as wider pH and temperature range . The large scale recombinant preparation has advantage in lot-to-lot consistency, superior purity and cost-efficiency. 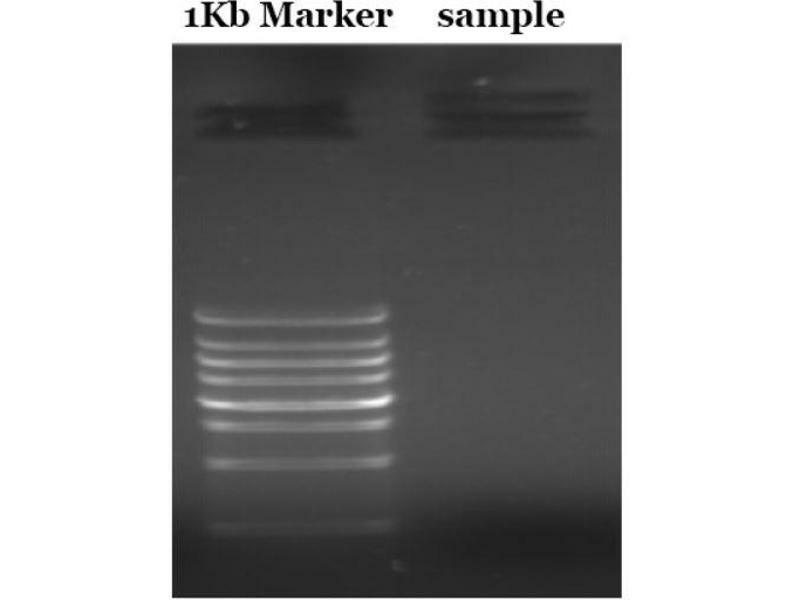 DNA-free nature of recombinant Proteinase K made it well-suited in isolating PCR and RT-PCR templates. 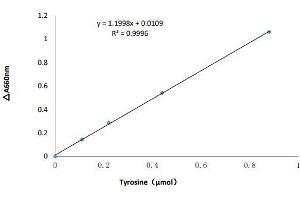 Unit Definition One unit is defined as the enzyme activity that produce1 µmol of tyrosine per minute from casein at 37°C at pH 7.5. Refer to the certificate of analysis for specific values for the present lot. 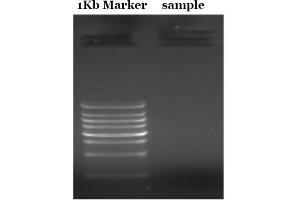 Background Proteinase K is a broad-spectrum serine protease originally isolated from fungus Engyodontium album. The protease was named “Proteinase K” for its ability to digest Keratin. Crystal and molecular structure studies suggest that the enzyme belongs to the subtilisin family characterized with a catalytic triad (Asp39-His69-Ser224) in active site. Proteinase K has no pronounced cleavage specificity and preferential cleavage site is the peptide bond adjacent hydrophobic amino acids. Inhibitor: The enzyme is inactivated by DIFP or PMSF (PMSF used at final concentration 5 mM. ). However, it is not inhibited by EDTA , iodoacetic acid, trypsin-specific inhibitor TLCK, chymotrypsin-specific inhibitor TPCK, and p-chloromercuribenzoate. Activator: To stimulate proteinase K activity, 1-5 mM Ca2+ can be added. 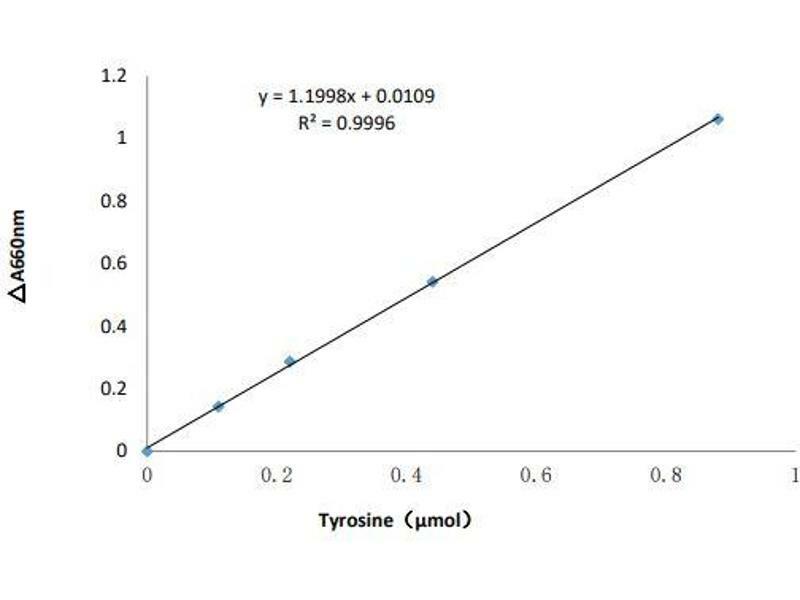 Optimization using activators can increase proteinase activity significantly. Enzyme activity will be reduced by 25% when calcium is removed by addition of EDTA. Enzyme activity will be reduced by 80% if the EDTA-Ca2+ complex is removed from the enzyme solution by gel filtration, while it can be partially restored by addition of excess Ca2+. 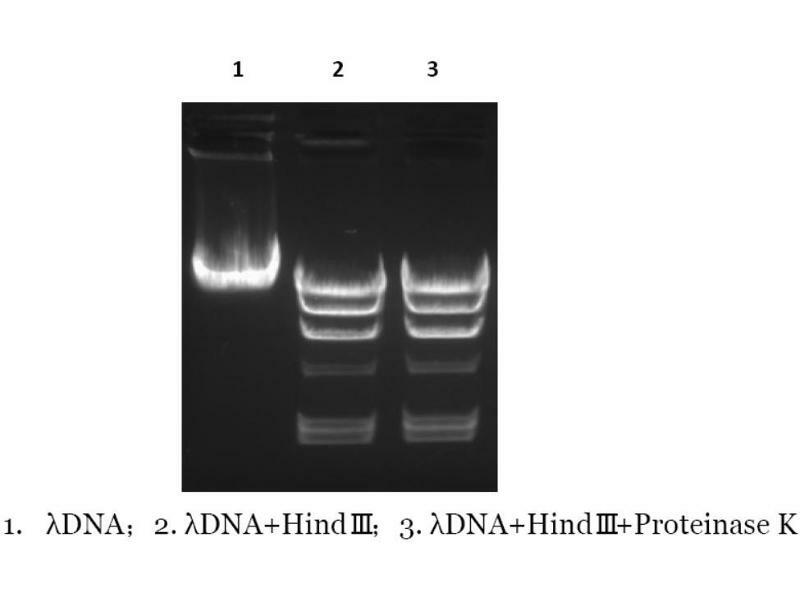 Protocol Proteinase K is commonly used in molecular biology to remove protein contamination from preparations of highly native undamaged nucleic acid because it rapidly and effectively inactives nuclease that might degrade the DNA or RNA even in the presence of denaturing reagents. Proteinase K is active in 1% Tritonä X-100 and fully active in 0.5% (w/v) SDS which denatures protein substrates to increase digestion rates. The enzyme works best at 50-200 mg/mL at pH 7.5-8.0, 37 °C and is usually denatured by subsequent phenol extractions. Incubation times vary from 30 minutes to 18 hours and proteinase K can auto-digest during long incubation. 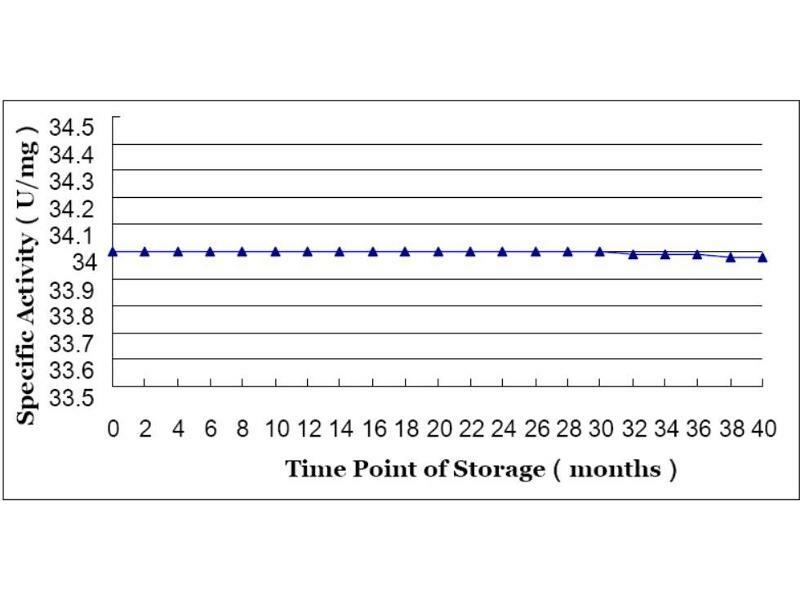 Storage Comment We recommend long term storage at -20 °C for lyophilized powder to maintain stable for at least 2 years. Enzyme solutions prepared as recommended maintain stable at room temperature for 12 months. Dilution buffer recommended: 20mM Tris-HCl, pH 7.4 Storage buffer: 20mM Tris-HCl, 50% Glycerol, pH 7.4.